They are your best friends when you take stem cuttings. 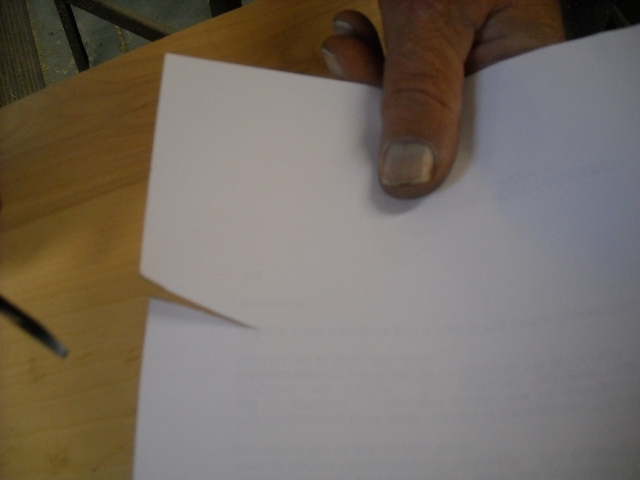 This is a Pop Quiz: Can your pruners cut a piece of paper? Sharp pruners, we were taught, make for clean cuts, and clean cuts make for good rooting success. Crushing, mashing or tearing damages plant pipelines and kills chances for successful rooting. Blades must be sharp, tight, and aligned. 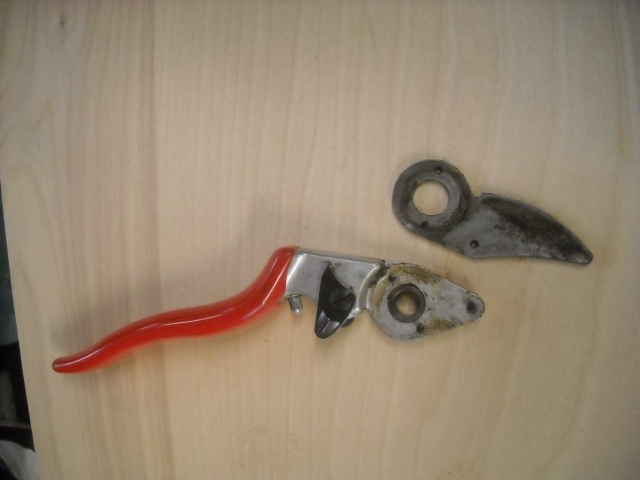 During our decades of gardening we’ve tried an assortment of pruners. Like old friends, our Felcos have always come through. Our oldest Felco is still in fine condition after 18 years of almost daily use (except on those days when it went AWOL). I know this sounds like a paid ad, but we’ve settled on Felcos exclusively. Bob chose Felco 8 on the recommendation of a plant propagator. The cutting head on the 8 is angled so cutting with it is easy on your wrist. Since my hand is smaller, Felco 6 was an obvious choice because it has a small grip and a small cutting head for getting into tight places. A second Felco 6 is dedicated specifically to propagation. The dedicated pair is closely guarded from the elements and from violent confrontation with heavy branches or grit-covered roots. For the record, we are talking about bypass pruners, which function somewhat like a pair of scissors. The upper blade slices past the lower, producing very clean cuts for use on tender wood. 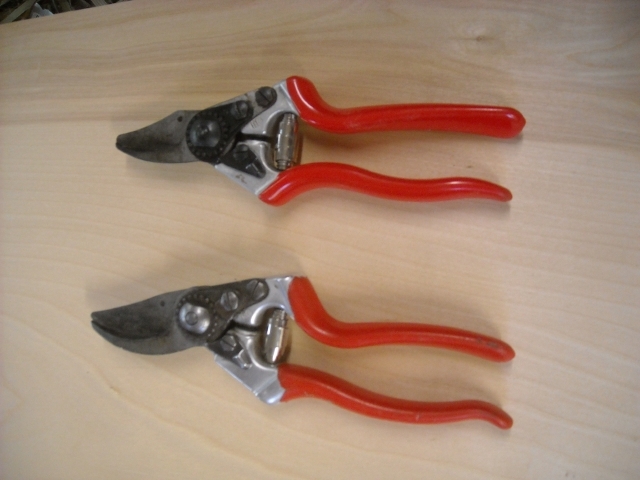 Don’t confuse these with anvil pruners (Felco #31) which work best for cutting hard or dead wood. Anvil pruners function like an axe coming down on a chopping block. A visit to The Felco Store on the Internet is always an education. It is an excellent site with lots of good information, worth a virtual trip before you purchase a pair of pruners. Product descriptions and pricing are clear, and shipping is free for orders above ten dollars. Maintenance is described in detail, as are replacement parts. And, by the way, the company offers left-handed pruners. Felco pruners are expensive compared to other brands, but they seem to keep chugging along, kind of like that unstoppable energizer bunny. Only the springs seem to wear out and need replacing. Which brings us to the care of our pruners. 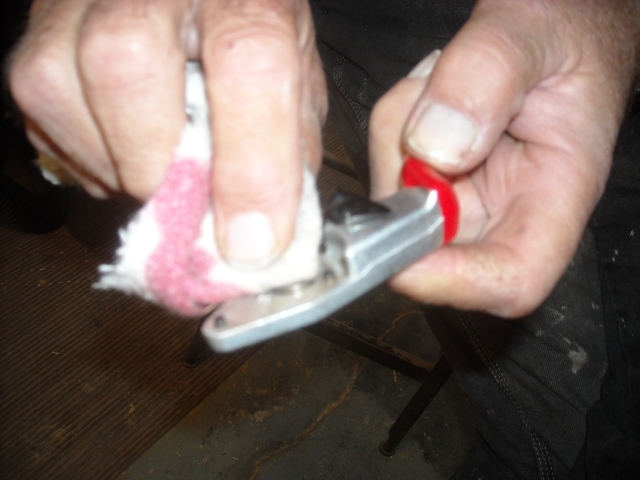 A spray with WD-40 and wiping with a soft cloth after down- and-dirty work helps rid pruners of grit, but to clean and sharpen a pruner properly, the pruner should be disassembled. Disassembled? My idea of high-tech is jiggling the toilet handle to stop running water, not disassembling a pruner. Bob tells me to relax. 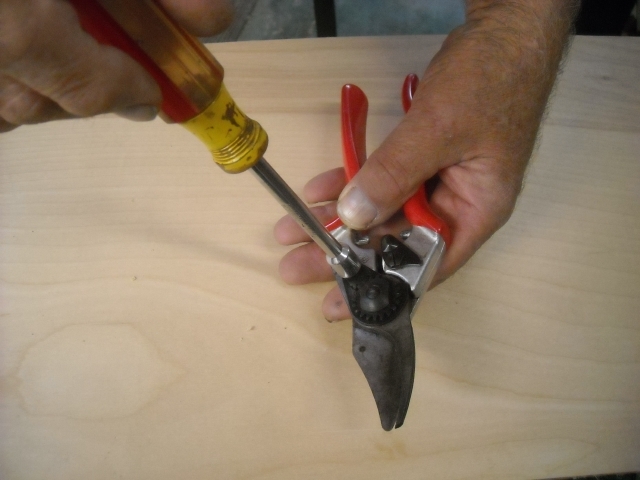 Disassembling involves removing a nut to separate the two handles. From there the cutting blade is lifted off its aligning pins and the retaining screw is removed to release the anvil. Wait a minute. Why are we talking about an anvil? These are bypass pruners, not anvil pruners. Yes, but the bypass blade is called an anvil. How is that for confusing? Well, it’s not as high-tech as it sounds. Felco takes you through the procedure on its site. Our goal is to get pruners working so they can cut leaves cleanly. If they can cut leaves, they can cut small stems. Gummy, chipped, or dull blades will not cut cleanly. Once the pruners are disassembled, Bob wipes them with WD-40 to remove surface grime. Blades that are gunked-up with plant sap Bob cleans by sanding with emery paper. Gunking can occur when I take a large number of softwood or semi-hardwood cuttings. Some plants are sappier than others, cases in point, the euphorbias (spurge), confederate jasmine, oleander and milkweed. 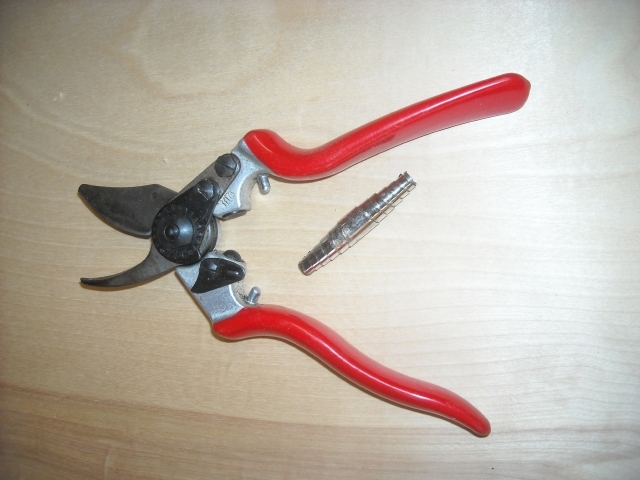 I rinse and dry the pruners immediately after taking sappy cuttings and spray them with WD-40. 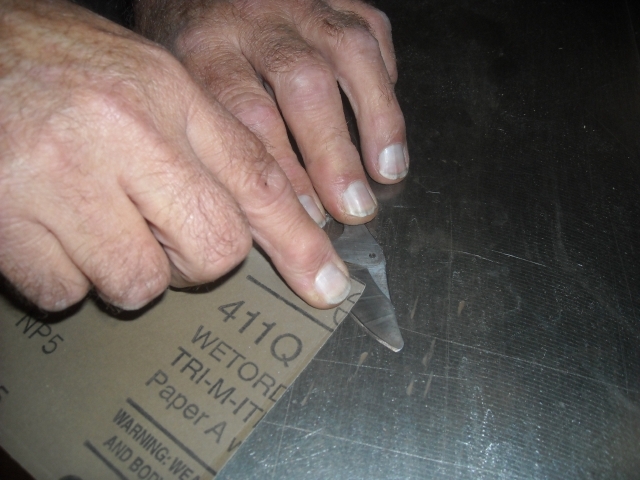 If a blade is in good condition, it will be sharpened as it is sanded with emery paper. Sanding should be done on a flat metal surface. Using a light touch, Bob runs his finger across (not along) the blade to see if it is sharp. He then inspects the blade for knicks and dings to see if a sharpening stone is needed to create a finer edge. Usually it isn’t. 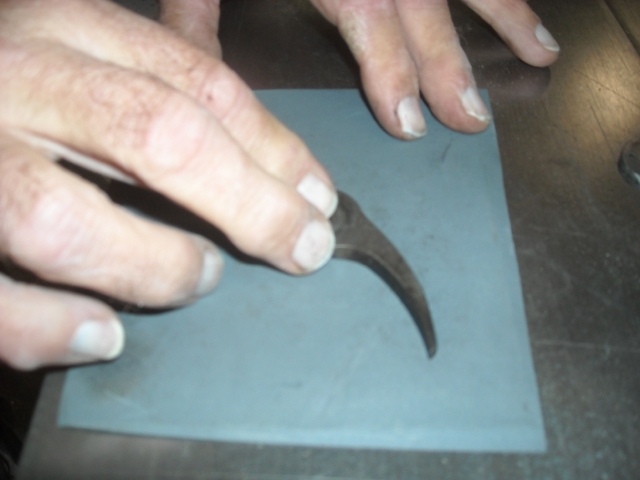 Stroking the stone along the blade from base to tip is recommended. Using mechanical sharpening tools is not recommended. The anvil is the thick, heavy blade. 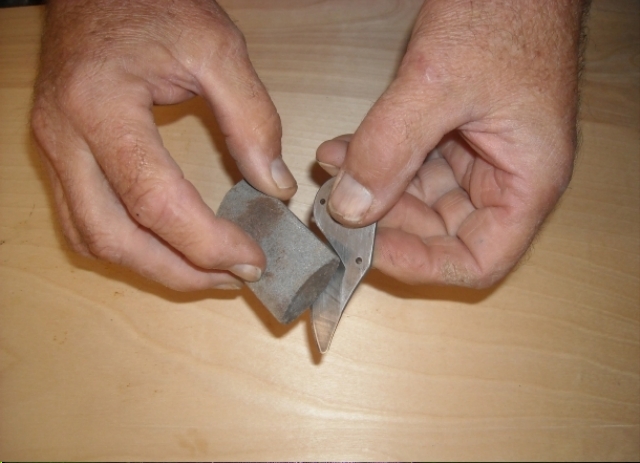 It does not need sharpening, but it can be cleaned by rubbing on emery paper. After reassembling the ungunked-now-cleaned pruners, Bob checks to be sure the cleaned and sharpened blades are tight and aligned. 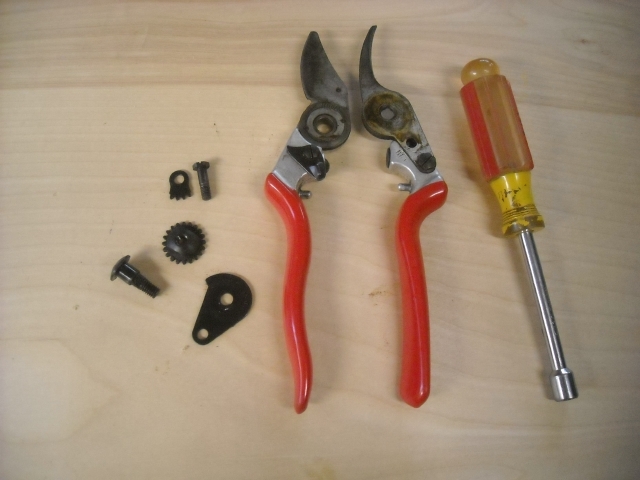 If the play between the two blades is excessive and cannot be eliminated by tightening the large center bolt, the frame of the pruners is probably twisted. 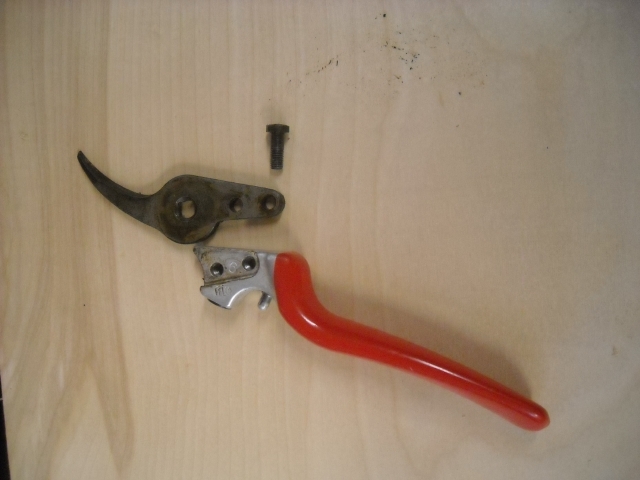 This happens when pruners, instead of loppers, are used to cut heavy wood, and it is bad. In this condition, they are unfit for taking stem cuttings. These pruners will never cut a piece of paper. Which is Bob’s final test. If the pruners cut a piece of paper cleanly, they are sharp and tight and will take good cuttings. If the paper gets caught and folded, and tightening the center bolt does not help, you may want to switch to other cutting tools we discuss below. Finally, Bob gives the pruners a quick spray with WD-40 to keep them working smoothly. Felco supplies an adjustment key with each pair of pruners which is used to remove the center bolt and speeds disassembling. Well, we lost ours years ago so Bob uses a wrench or nut driver to loosen the nut until he can remove it by hand. He assures me that once you get the hang of it, disassembling, cleaning, sharpening, reassembling and lubricating take only about ten or fifteen minutes. He does this once or twice a year. Meanwhile, I jiggle the toilet handle. When our pruners are not in use, we try to put them away with the blades open. This reduces tension on the spring and extends its life. If disinfecting is needed, a dip into Lysol is advised. It kills pathogens but it does not corrode like clorox. Some people use rubbing alcohol. We have rarely disinfected pruners because we either dig up diseased plants or chain saw them down. Pruning is usually not worth while. As a final note, some experienced propagators use sharp utility knives or razor blades and make their cuts on a wood surface. With these tools they are always assured of new, sharp blades that will make clean cuts and require no maintenance. It takes some practice to become efficient with these methods, and old arthritic hands can tire of the repetitive motion. However, sharp razor blades and utility knives are much preferred to scruffy pruners for propagating. Using Hormones Soilless Media? Small Pots or Large Beds for Cuttings?